← Emergence … since 2013! 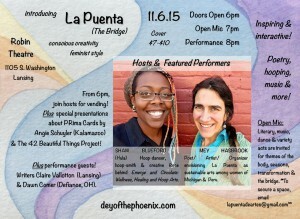 La Puenta–a feminized version of “bridge” in Spanish–is a project to develop sustainable-arts among women in Michigan and with Peruvian artisans. Supporting and catalyzing creative opportunities among Michigan women in need–both socially and economically–and Peruvian artisans is “soulful” work. 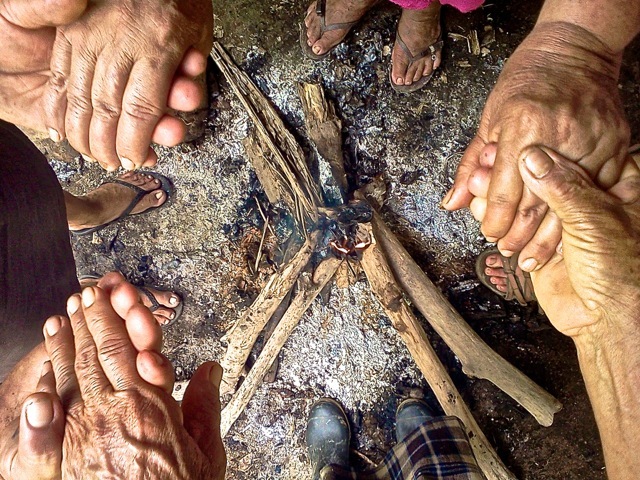 Because nourishing women’s livelihoods also nourishes our sense of purpose. 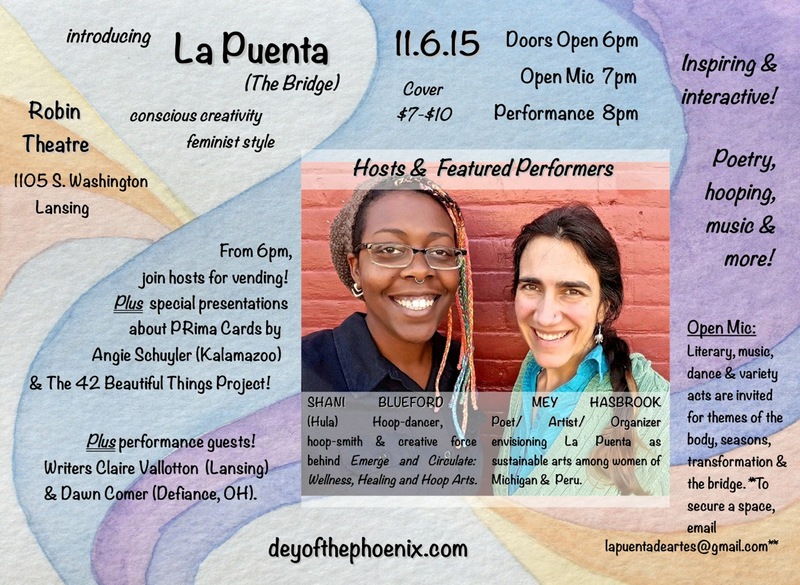 I am introducing La Puenta formally –and with fun!– through a creative program on Friday, November 6, in Lansing, Michigan, at The Robin Theatre of REO Town. Since May, co-organizer and co-featured artist Shani Blueford (Kalamazoo) of Emerge and Circulate and I have been imagining this occasion for you! Shani’s work with hoops and mindfulness is guided by enthusiastic positivity. Our creative experiment brings together poetry, hooping, song, and more! This vision for La Puenta emerged during my first travel to Peru (December 2014 to April 2015), and expands how I organize related to the arts. After nine years honing creativity as a tool of healing and spirituality, I am excited to further shape creativity as a tool of economic equality. At this stage, I am combining artist residencies with exhibitions in order to develop the project across multiple communities. My traveling exhibition “Movimiento…De la Cabeza a los Pies/ Movement…From Head to Toe” began the dialogue, and now November’s program launches La Puenta’s vision! 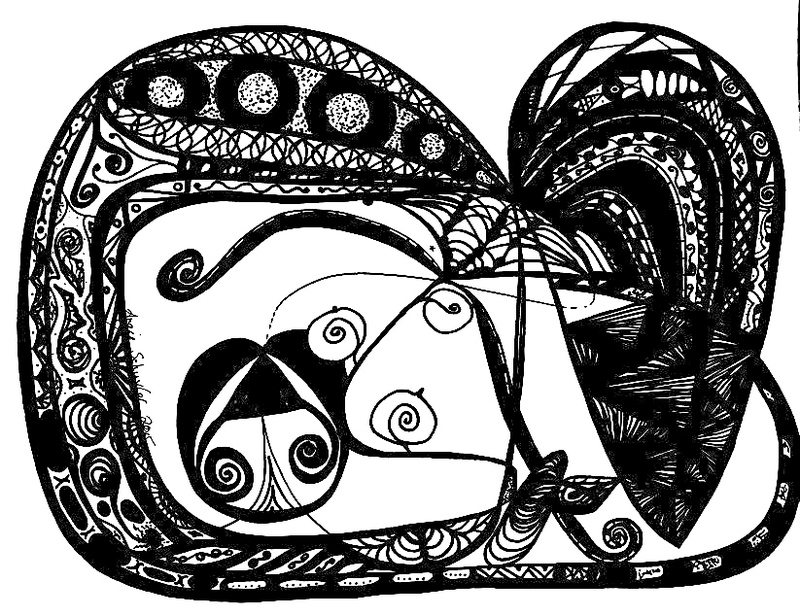 A PRima drawing by Angie Schuyler. Come November 6, doors open at 6:00pm for vending with Shani and I plus our special guests. 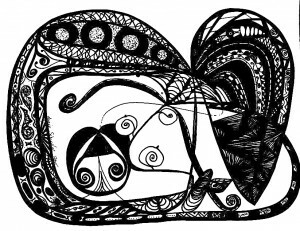 Joining us are artist Angie Schuyler (Kalamazoo) with her PRima cards, a tool for meditation based on original drawings that double as “paper canvas” for coloring. Also on-site is writer Dawn Comer (Defiance, OH) of The 42 Beautiful Things Project, with objects that have traveled anonymously through the postal system to celebrate beauty. At 7pm, the open mic starts. Themes include the body, seasons, transformation and the bridge. Literary, music, dance and variety acts are welcome. With limited time available, email ahead to reserve your space at lapuentadeartes@gmail.com. The show begins at 8pm, featuring an interactive inspirational program with Shani and I–plus our special guests: writers Dawn Comer and Claire Vallotton (Lansing)! I have had the joy of creating alongside these talents for many years. It’s an honor to share the stage and hear their amazing ways with words. The program cover is a sliding scale of $7 to $10. Funds will recuperate expenses for presenting this program, with proceeds supporting my upcoming six-month journey to Peru. From early January to early May, I will be the first artist-in-residence at the Healing House of Cusco, a center committed to community through creativity and spiritual practice. La Puenta will continue to grow during that time with public workshops and an exhibition of “Movimiento“. Your continued presence, support, and engagement are most welcome as I transition into this new work. Thanks for accompanying me on the journey, and helping to spread the word about La Puenta’s launch. This entry was posted in Uncategorized and tagged Angie Schuyler, Claire Vallotton, Cusco, Dawn Comer, Healing House, La Puenta, michigan, Peru, PRima cards, Robin Theatre, Shani Blueford, sustainable arts, The 42 Beautiful Things Project, women. Bookmark the permalink.